Jude Sparks was out on a family hike in the desert near Las Cruces, New Mexico, testing walkie-talkies, when the then-9-year-old boy tripped over a rocky protrusion. When Jude got up again, he examined what appeared to two large, fossilized teeth jutting out from the terrain. Farther up, he spotted what looked like a tusk, he added. But Jude's brother Hunter, who had been running behind him, didn't seem too impressed with whatever Jude had found. "Hunter said it was just a big, fat rotten cow," Jude told KVIA News, which first reported the story. "I didn't know what it was. I just knew it wasn't usual." The boys' parents photographed the curious mass, then helped Jude look up experts online that night, he added. They emailed Peter Houde, a biology professor at New Mexico State University who maintains a lab devoted to paleontological studies. "I immediately recognized the importance of what it was," Houde told the news station. "We went out there the very next day to have a look at it." It turned out Jude's instincts were correct. He had discovered the fossilized skull of a Stegomastodon, estimated to be more than 1 million years old. The now-extinct ancient relative of the elephant had two enormous tusks that curved upward and stood nearly 9 feet tall. The discovery was rare because both the animal's mandible and a tusk were exposed to the surface, Houde said in a paper published on his website about Jude's discovery. "Fossil bones from the same animal are rarely found together in our area," Houde wrote. What's more, Stegomastodon fossils are extremely fragile, despite the animal's behemoth size. "We're really, really grateful that (the Sparks family) contacted us, because if they had not done that, if they had tried to do it themselves, it could have just destroyed the specimen," Houde told the New York Times. "It really has to be done with great care and know-how." After several months, Houde and his team finally got permission from the landowner to dig on the property - under the condition the site remain a secret, according to a university news release. In May, Houde and a team began the week-long, painstaking work of digging up the fossil. The collagen in the bones had long since decomposed, so the fossils "can easily disintegrate under their own weight before your very eyes as soon as the sediments that cradle and support them are cleaned away," Houde wrote. Because of that, the excavation required exposing parts of the fossil, little by little, and allowing it to fully dry before applying a hardener. Little by little, they unearthed a nearly complete skull, only missing a tusk. "It's just been very exciting," his mother, Michelle Sparks, told the news station. "Especially for the boys because every child dreams of finding bones and them being actually old." Jude, now 10, told KVIA News that most of his friends still don't believe that he found a fossil more than a million years old. However, though Houde is continuing to study and preserve the fossil, eventually he anticipates it will be available for public viewing at New Mexico State University's Vertebrate Museum. 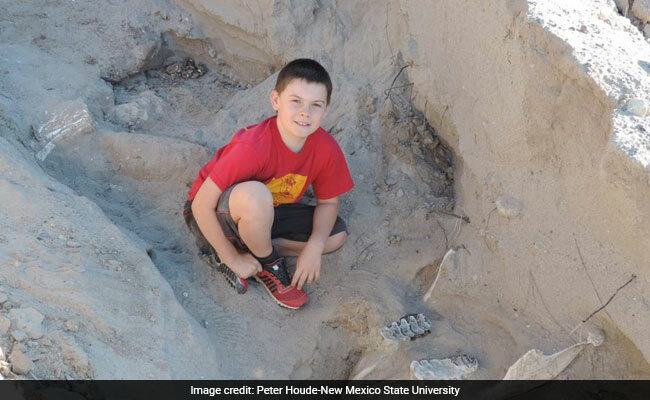 "I have every hope and expectation that this specimen will ultimately end up on exhibit and this little boy will be able to show his friends and even his own children, look what I found right here in Las Cruces," Houde said in a university statement. It wasn't the first time someone had made such a fortuitous fossil discovery. In 2014, a bachelor party camping at Elephant Butte State Park in southern New Mexico discovered a nearly complete fossilized skull of a Stegomastodon. That fossil is now at the New Mexico Natural History Museum. In 2015, a then-4-year-old boy named Wylie Brys happened upon the fossilized bones of a nodosaur while exploring land behind a Dallas-area shopping center. "He's a little kid," his father, Tim Brys, told The Washington Post then. "He likes playing in dirt as much as finding the fossils, I think."